Use the delivery, pickup, prep, in use, or other opportunity dates in your opportunities (Job Planner) iCal feed. The opportunities (Job Planner) iCal feed lets you see your opportunities on the calendar on your smartphone, computer, or other device. By default, events on the iCal feed for opportunities will start and end based on the start and end date of the opportunity. For example, the event in my calendar app for the opportunity below starts July 10th and ends July 21st. 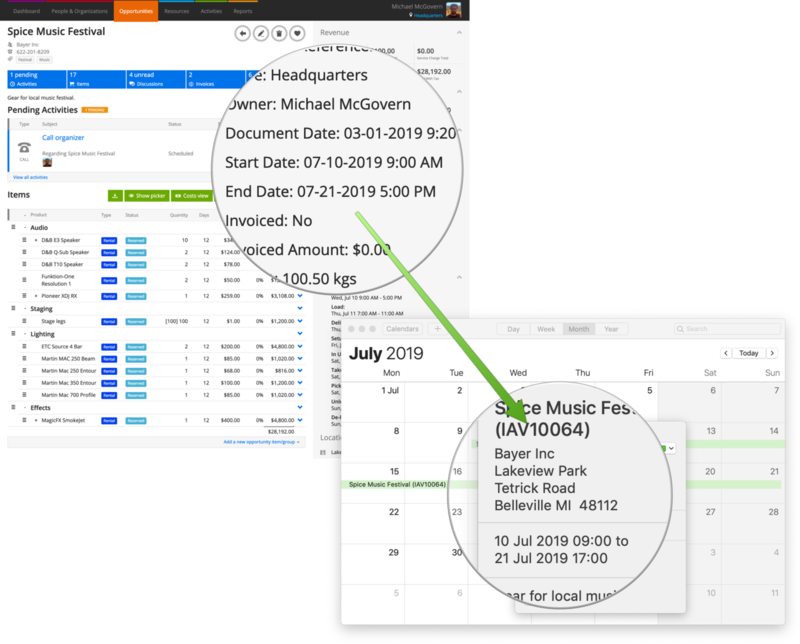 If you’d like to use other dates in the opportunity scheduler for your calendar events, like the delivery & collection dates or the prep & de-prep dates, you can add start_attribute and end_attribute parameters to your iCal feed link. Keep in mind that you’ll need to use the extended scheduler to use the start_attribute and end_attribute parameters. Go to the Job Planner by going to Opportunities > Job Planner. Click the link that says iCal calendar feed for your opportunities at the bottom of the screen. The long links on this screen are your iCal feed links. There are four, one for each type of opportunity: orders, quotations, drafts, and inquiries. Copy the link you’d like to change and paste it somewhere safe, like a text editor. 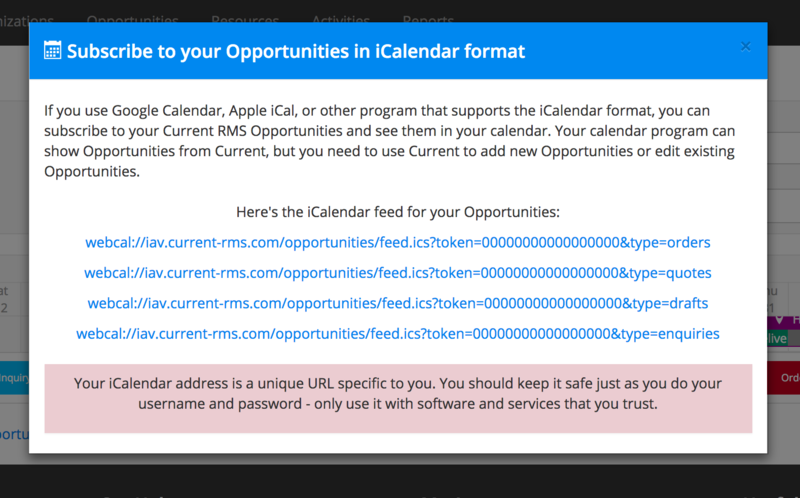 ⚠️ Keep your iCal feed link safe like a username and password. Only use it with trusted software and services. Here we’re using an example order iCal feed. If you wish to use these, replace the part of the URL before &start_attribute with your own iCal feed from the Job Planner. Where a date that you’ve used as an attribute in your iCal feed isn’t filled in, Current will use either the start or end date value. If the end_attribute is earlier than the start_attribute that you choose, Current will use the end date value. How do I subscribe to an iCal feed?